In the background is an idea from Wilfred Bion, that groups sometimes behave as if everyone has agreed to act in a particular way, but without there having been any discussion. His suggestion is that this reflects something happening at an unconscious level in the group. He coined the term “basic assumptions”, and named three common ones — that the group has become dependent on someone acting as “leader”, or has mobilised two people to work on its behalf as a conversation in a pair, or that it’s gone into a fight-flight mode. In the context of management, these ideas are useful as they can shed light on what’s going on when a group has gone from what it thinks it is trying to do, and there’s a sense of “something” getting in the way. Other thinkers have observed other basic assumptions. 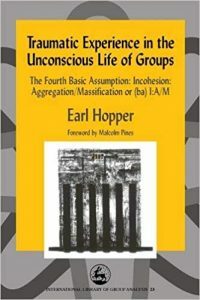 Earl Hopper named a “fourth basic assumption”, with the moderately incomprehensible name “basic assumption incoherence, aggregation/massification” to indicate a situation where things have become very broken. He joined together two things others had observed. One is called “basic assumption me-ness” to describe a situation where individuals feel sufficiently uncomfortable to mean they act as if the group doesn’t exist. This goes beyond “is the group trustworthy?” or “how do I find my place in the group?” to extreme withdrawl. It was first named in working with Roman Catholic monks and nuns after Vatican II: the point was that, faced with huge changes in their world, some were reacting by extreme withdrawl. The other is “basic assumption one-ness”, describing a situation where people in the group act as if it is met for some higher transcendent purpose. Sometimes religion makes sense in these terms. Hopper’s point was that both of these involve not engaging with the group. The sense is that the group has become an unsafe place, so people are disengaging at a very visceral level. Others have extended this to suggest this is visceral, gut-level stuff, that barely gets near conscious thought. This is feeling like an apt way to think of the present chaos around Brexit. There are Leavers and Remainers acting as if the other group hardly exists. This is exaggerated by social media — personally I have to make an active effort to engage outside a twitter / facebook bubble where no-one identifies with Brexit. I imagine that most people are seeing social media streams that show only like-minded people, so one is dimly aware that the reality one is seeing is not complete. Normally a country would look to its government for leadership. In elections, people are elected in whom the electorate are placing a trust, so people are being mobilised to hold the nation’s dependency. The referendum itself saw the Cameron government effectively abandon its responsibility in this area. That would have reflected pressures building up the system, but already indicates a failure of dependency. The referendum campaign exaggerated this because of the degree of lying. For the Leave side this consisted of claims and stories bearing little relation to reality, but which mobilised people’s anxieties. It’s ended up as the impression that “you can’t trust the system” or that they are “standing up against elites”. In Hopper’s terms, that’s both to pull back from the idea of the nation and project some paranoid fantasies into its place, and then to pursue the transcendent purpose of “Brexit”. That Brexit wasn’t defined actually helps this, because it becomes a holy ideal, untarnished by reality — as long as it is undefined, its virtue can’t be proved, and therefore can’t be disproved. Much more recently there have been claims from supporters of Brexit that they are “defending democracy” against those who want a further referendum. Defending democracy by refusing a vote sounds surprising. That’s made more sharp by comments before the referendum in which Nigel Farage claimed that a 48%:52% vote the other way would not have been the end of the matter, and Jacob Rees Mogg’s argued for two referenda, with the second coming after a deal has been negotiated. The Leave campaign was vague and contradictory about what leaving would actually mean, and two years after starting the Article 50 process, we’re still waiting for Parliament to work out what Brexit will look like, so it’s hard to claim that what the eventually come up with is what people knew what they were voting for. If opposition to Brexit now were really about “defending democracy” these things would matter. But if “democracy” is another example of a transcendent purpose, then it in the abstract is what matters, not the messy and complex reality of democracy. I don’t buy the idea that the Remain campaign lied, but there certainly were predictions of serious consequences. These were not lies, in as much as most of them would only turn into reality after the UK left the EU. George Osborne mis-calculated when he spoke of the need for an “emergency budget” if there was a Leave vote, because that was heard as a threat of a “punishment budget” but the extreme action needed from the Bank of England to steady the pound, and the speed with which his successor abandoned austerity sound like a Osborne’s emergency budget in all but name. But the Remain campaign was channelling anxieties about the economy, and anxieties about peace, stability and identity also at a very basic level. As someone on the pro-EU end of the spectrum, I was aware of fighting back tears each time I saw an EU flag in the immediate aftermath of the referendum: that’s a visceral, physical response that also makes sense at the level of transcendent ideals. It certainly includes a level of “can my country be trusted?”, which are not helped by my own recognition of the potential for the UK to be afflicted by the same disease that took hold of Germany in the 1930s. Writing this soon after the huge People’s Vote march on 23 March, I am hearing lots of rumours of pressure on Theresa May to resign. Yet common sense says that the UK can’t afford the turmoil of a Tory leadership contest, or even the shock of someone new to the role taking over given the tight schedule around Brexit. This doesn’t feel like the call to dependency of “give us a new leader”. It does feel like the broken dependency of “there is no leader” (so we try to mobilise another, also likely to fail). One way out of this mess would be to find a strong leader, capable of holding enough people’s trust, and connecting with the primitive anxieties that have emerged. That’s a pretty good summary of a fascist leader: the point being that the fascist leader is one with whom people feel they can identify, safely grounding the parts of themselves that feel anxious but which are hard to articulate. Hopefully the UK is not at a point where this would work — but stories of Tories jockeying to succeed Theresa May ring alarm bells, and Nigel Farage claiming he’s about to stop being “Mr Nice Guy” should ring even bigger bells. Fortunately more people seem to oppose him than trust him. The other path is someone who can emerge as a wise paternal figure — Ken Clarke leaps to mind — who could hold the process in a way that provides enough stability for things to settle down. What this actually means, in terms of Hopper’s Fourth Basic Assumption is that he (or someone like him) could draw enough of the emotions of anxiety to mean things start to feel more stable, so people can pull back from the tribal extremes — particularly the “Give us Brexit [and don’t say we don’t know what it means, but don’t ask us to explain]”. Part of the genius of the design of the EU is that its way of working is set up to make it very hard for a fascist mindset to take over. There’s consultation, discussion, collaboration and co-decision everywhere, which means there’s massive barriers to any one leader taking on all the unconscious desires of people needing a leader to identify with. pull back into a mix of “the nation/elite/EU can’t be trusted” and “escape to the ideal of Brexit”. The last of those lands us with support for Brexit. The “strong leader” solution doesn’t work — it’s rooted in people’s fear-induced desires, rather than reality. It’s just possible that parliament may take on some of this, in finding a way through. It’s been reflecting the chaos of the nation in all its divisions, which also means that finding a way through might help the nation do that. The House of Lords might also have a bigger-than-usual role to play. The problems with not being elected also map onto it holding something of the role the aristocracy used to play. I don’t mean aristocracy in terms of “the toffs behaving badly”, but rather, the aristocrats in whom people used to place trust. This might just offer enough stability from the past that’s not rooted in distorted memories of war to offer the stability people need. In psychoanalytic terms, Earl Hopper’s Fourth Basic Assumption seems to describe the phenomenon, rather than explaining it (the bigger explanation probably needs to start in Lacanian ideas of foreclosure). There are other possibilities that might explain how we come to be here, but for the moment, describing the problem also flags up how stability in parliament, with the Lords playing quite a role, might enable things to settle down. The rest of the EU can’t intervene directly without mobilising lots of fears. The narrative of “The EU telling us what to do” is already too strong. But it has been clear about maintaining peace in Ireland (which is what the backstop is actually about) and imposing deadlines which are to do with how the Brexit process meshes with elections to the European parliament (the April 12 deadline is what would be needed for the present parliament to ratify something). This injects a layer of reality. The crucial part here is that there is potential for actual reality to cut through fantasy: there is a massive difference between a Brexiteer fantasy of “Europe telling us what to do”, mobilising fears of an invading army, and a reality that says “We need to do it by this date so things can get through the European Parliament (where British MEPs vote alongside MEPs from the rest of the EU)”. Previous Previous post: Why are some people (wrongly) claiming petition to retract Article 50 notice has been fiddled?